This is the culmination of a series of DyeStat year-end awards for 2006-07. The DyeStat Most Outstanding Performers series included boys and girls distance, sprints, hurdles, jumps, throws, and multi-events. These are followed by the DyeStat Athlete of the Year award. Selections are made by DyeStat editors and are based a combination of multiple major victories/honors won and performances on all-time and yearly lists. Performances from outdoor track, indoor track, and cross-country are taken into account. In the crazed, euphoric moments after the Nike Outdoor National boys two mile, when the flashbulbs were still popping and the journalists were still circling for quotes, when stunned fans were still consulting stopwatches in disbelief and fellow competitors were still wobbling the post-race dance of the depleted, Matthew Centrowitz of Annapolis, Maryland, was scanning the backstretch grandstand for one grinning, mustachioed face—his father’s. Somewhere in that cheering throng was Matt Centrowitz Sr. and his wife Beverly, both accomplished runners in their own right, now watching their son bask in the limelight of an historic track performance. Squinting into the camera lights, the new national champion began patiently fielding interview questions as meet officials escorted his parents from the bleachers and across the empty track. The plan, he said, casting a quick glance over his shoulder, had simply been to win. No, he allowed, peering politely past the interviewers, he hadn’t known the race was going that fast. It was, he said, Unreal. And Perfect. And—and then his parents were there, extracting him from the cluster of reporters for a congratulatory embrace. In the past few years, a great deal has been made in track and field circles of the apparent revival in American schoolboy distance running. We are witnessing a return, many opine, to the glory days of the 1960s and 70s, when sub 9-minute two miles and low 4-minute mile races were more common than they became during the relative dry spell of the 1980s and early 90s. With roots that include an indoor 2-mile duel between Andy Powell and Franklyn Sanchez and the breakout performances of Donald Sage, the revival is largely attributed to a clutch of new-millennium runners tagged with single-name monikers like Ritz, Webb, Teg, Hall and Rupp. But if you’re looking for a symbolic bridge between the past and the present, a flesh and blood encapsulation of the work ethic of the 60s and 70s springing back to life in the legs of the MySpace generation, look no further than that midfield embrace between a father and his son. 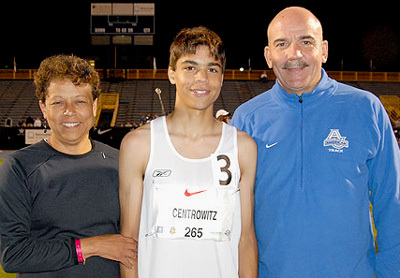 Matt Centrowitz Sr.—the original Centro, the 4:02.7 high school miler from Power Memorial in Manhattan, 8:56 two miler, eventual American record-holder at 5000 meters and now head coach at American University—wrapping his arms around Matt Centrowitz Jr.—the “new” Centro, the 4:03.40 miler from Broadneck HS in Maryland, 8:41.55 two miler, and now the 2007 DyeStat Male Athlete of the Year. 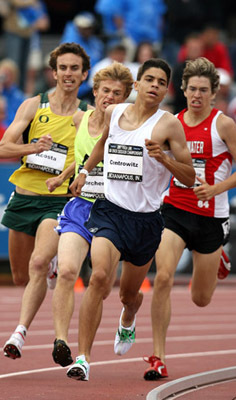 Matthew Centrowitz had a fine cross country season, culminating with an 8th place finish at Footlocker Nationals, followed by an indoor campaign which included a runner-up finish in the Nike Indoor Nationals 2-mile, but it was his revelatory outdoor season—and the indelible 8-lapper he authored in Greensboro, North Carolina—which elevated him above the other fine athletes of ’07 and cemented his status as the AOY. 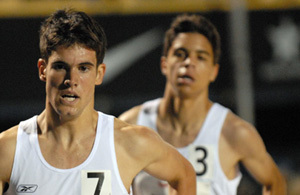 The event he was mulling over was the USATF Junior 1500, a race less than a week away that would pit him against NON mile champion Sam Borchers and future University of Oregon teammate and defending Junior 1500 champ A.J. Acosta. There had been some consideration given to racing the 5000 meters instead, but Matt Sr. thought it important for his son to gain experience running qualifying heats on multiple days—something he’d have to deal with in college and beyond—and the 5k was a final-only affair. 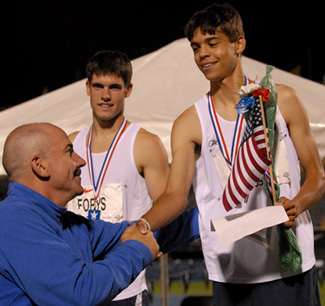 While Matt’s father wasn’t his official high school coach, the senior Centrowitz and Broadneck head coach Dana Dobbs struck an amicable balance in supervising Matt’s training, with Dobbs providing many of the daily workouts and Matt adding on as necessary with his father’s guidance and input. That recipe delivered another fine performance at the USATF Junior meet, where Matt led the 1500 only meters from the line (left, photo by Vic Sailer), before Acosta slipped past for a 3:49.53 to 3:49.54 tactical win. The runner-up finish provided Matt with his first appointment to a US national team, allowing him to wear the red, white, and blue at the Pan American Games in Sao Paulo, Brazil. The American Milers race, hastily assembled to provide not only Centrowitz but also Masters runner Jim Sorensen with a chance at sub-4, resulted in an outcome remarkably similar to the Grand Prix mark—4:03.47—but with a slightly altered perspective from Centrowitz. Whether it was the proximity to his mother’s homeland or a desire to end the season with a flourish, Centrowitz flipped the finish order on Acosta at Pan Ams, surging past for a 3:56.63 win that featured the same whisper-thin margin of .01 which divided the two at USATF. Speaking about the Pan American meet now, Centrowitz says its value extends well beyond an opportunity to get his feet wet in the world of international racing. With future University of Oregon teammates Acosta and Kenny Klotz (who won the 10k race) on the US Junior roster, Centrowitz had a chance to get to know his fellow Ducks outside the whirlwind of recruiting visits and college selection. Acosta—brash, confident and loquacious—and Klotz—quieter, introspective and more stolid—offer a study in healthy contrasts that has Centrowitz excited about the diversity of athletes he’ll soon call his teammates. Used to training mostly alone, Centrowitz can’t wait for the talented pool of workout partners who’ll push him through the paces. “Ten to fifteen guys to train with? That’s exactly what I’m looking for,” he says. When Matt matriculates to Oregon, however, he can’t help but pack up the parental lessons and life experience and genetic material that have gotten him this far. He’s realistic about the stacked roster that awaits him in Eugene, but feels great about the progress of his summer training and confident that the Pan Am race came early enough to allow him time to recover and still build a solid base. He’s planning to room with Footlocker national champion Chad Hall this coming year, and has discussed the possibility with Oregon coach Vin Lananna of eschewing the presumed redshirt for a Duck jersey in the fall.